near the front of our new property. It had rained heavily in the night and our fear was that perhaps the strong winds and wet soil had not held the structure because cement takes several days to dry. Then suddenly... "There it is! It's still standing!" We breathed a sigh of relief. There it was, the simple tall, thin wooden cross on top of a grassy knoll. 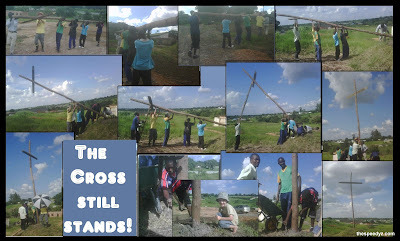 It reminded me of the "old rugged cross" - nothing special (by sight), but to the believer, it holds a lot of meaning. As we drove closer to the property, fixing our eyes on the cross, our minds flashed back to a conversation we had a week earlier. When we first engaged Reuben, the man who organized the leveling out of the land, we asked him if he was born again. He was, and seemed pleasantly surprised that we were more concerned with the state of his soul, than just his line of business. He was eager to hear about the church and the vision of the ministry. As we told him, he listened intently, and said, "You know, few churches preach salvation anymore." The comment reverberated in our minds. So many people seem to be lost in the cloak of religion, but have no understanding of the cross and of salvation. Every generation needs to be evangelized. We much preach Christ, crucified. What else really matters? The cross still stands.